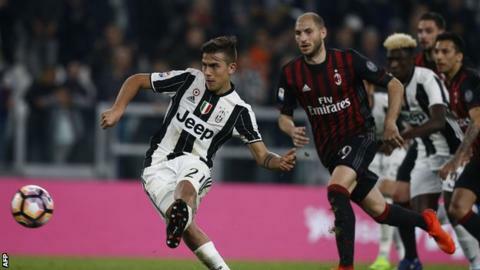 Paulo Dybala scored a 97th-minute penalty to give Juventus a dramatic win over AC Milan and extend their lead at the top of Serie A to 11 points. Mattia de Sciglio conceded the penalty in the 95th minute with a handball, just minutes after team-mate Jose Sosa was sent off for a second yellow card. Medhi Benatia had given Juventus the lead on 30 minutes, before Carlos Bacca equalised two minutes before half-time. Second-placed Roma, who have a game in hand, play Palermo on Sunday. Juventus, who are on track for their sixth successive Scudetto, have won 31 consecutive Serie A home games. The hosts, who lost to Milan in both the league and the Italian Super Cup final earlier in the season, had dominated the early exchanges, with Marko Pjaca and Dybala keeping Gianluigi Donnarumma busy in the Rossoneri’s goal. Juve deservedly took the lead when Dani Alves chipped the ball to the adventurous centre-back Benatia who controlled it on his chest and smashed his shot past Donnarumma from close range. Milan hit back against the run of play, as Gerard Deulofeu counter-attacked up the left wing and played in Bacca who poked the ball beyond Gianluigi Buffon to equalise on 43 minutes. The Rossoneri grew into the game in the second half but it was Juventus who had the better of the chances with Sami Khedira, Miralem Pjanic and Pjaca going close. The final moments proved the most exciting as first Sosa saw red in the 93rd minute for a bad tackle on Kwadwo Asamoah. Two minutes later Gonzalo Higuain’s bicycle kick was inches wide and he then saw another shot tipped away by Donnarumma. Then came De Sciglio’s handball and Dybala kept his nerve to slot his penalty past 18-year-old Donnarumma to spark wild celebrations.